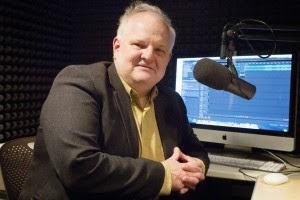 Classical Connections: Classical Profile: Patrick Neas: From KXTR to Radio Bach online. Classical Profile: Patrick Neas: From KXTR to Radio Bach online. Are you aware that beginning in the 1950's, Kansas City was home to one of the best classical music radio stations in the nation? On 96.5 FM? For me, the voice of classical radio is, and always will be, Patrick Neas, who joined KXTR as an overnight announcer in 1984. He soon worked his way up to program director and then morning show host. I remember driving to KC many times as a child to visit my grandparents, and as soon as we got close to KC, we would turn to 96.5 and try and pick up KXTR's signal. It was such a treat to be able to listen to classical music on the radio, and not just for a few hours a day....but around the clock. It seemed like a miracle that a city the size of KC would have such a treasure on its airwaves. Later down the road, I studied Radio-TV-Film in college, and hosted a classical music program on air, and later became assistant station manager of WISU at Indiana State University. I learned a lot listening to Patrick Neas and tried to apply it to my own style. He was a huge influence on me. I reached out to Patrick (I follow him on Facebook) and asked him if he would be interested in getting together sometime to talk about our shared passion: classical music. He graciously accepted my offer and we had a great visit recently at a local coffee shop where we connected instantly. For me, it was like meeting a celebrity. TH: How did you get your start in classical music radio? PN: I was going to Rockhurst and I always loved classical music and I was a big fan of KXTR in high school. So in 1984, I was in college, and I called up the program director of KXTR and asked for a job and sure enough they had an overnight shift. And they asked me to do a pronunciation test and I passed it. And so from that once a week overnight shift I just stuck with it and eventually became a full-time announcer, then became program director and then became morning show host. TH: 1984 to when? When did KXTR go off the air? TH: When did the signal leave 96.5 FM and move to AM? PN: They took us off of FM in 2000. They thought they could make more money off alternative rock. We were running KXTR in a shoestring budget. They had to add a whole staff of people when they switched. Plus, we had really good ratings when they took us off FM. We had a 4 share, which put us in the top 5 rated classical stations in the country. TH: I remember my dad always loved classical radio. As a youngster in Chicago, I remember him listening to WFMT quite often…which is still on the air. And then we had KMFA in Austin. And of course, whenever we came to KC, we always had the radio on KXTR. PN: I worshiped WFMT for their programming. Their ratings were not as good as ours, but they had more competition in their market. For a long time, Chicago had 2 classical music stations. And universities too that also played some classical music. When I started working at KXTR in 1984 we had a program director who showed me the schedule that WFMT published in a local magazine, and it didn’t pander at all….they didn’t play Pachelbel’s Cannon over and over…and I respected that so much and it has guided me too. I’ve never tried to pander in what I program. I do try to be reasonable……I’m not going to program Schoenberg’s Pierrot Lunaire during morning drive…but you know on the other hand, I am going to play an aria. But we had consultants in the 90’s that did not want any vocal music on the station. And they had audience testing….so they would play the William Tell Overture…which doesn’t really get going for about 10 minutes….the beginning is very unfamiliar for a lot of people (who only know the “Lone Ranger” theme from it). So they would play it for a minute and the testing audience would give it a thumbs down…and they’d pull the William Tell Overture from the playlist! They just didn’t understand the classical format at all. TH: Unlike other formats….classical music does not fit into a little box. PN: I do have to say that when I was a little kid, my family had these 2 albums where they would cut right to the “Lone Ranger” theme. And as a kid that grabbed me, but I think for the average radio listener, that you have to give it a little time to breathe. TH: Speaking of children’s records…..since we are both from the same generation too, do you remember a record called Sparky and the Magic Piano? TH: I don’t know anyone else who does! That’s so great that you do! TH: Do you listen to other types of music? PN: I do listen to other things, but I would say at least 90% of it is classical. TH: So how did you get introduced to classical music? PN: My family loved music, and they had music on all the time. And all different kinds too. My parents were not just classical music people. They had Eugene Ormandy’s record of Strauss waltzes next to the Beatles, and Simon and Garfunkel. So I was exposed to all of this good music. But for some reason classical music started to click with me in high school. I still remember seeing Woody Allen’s movie Love and Death..and that really triggered a love of classical music. TH: Prokofiev……. (the music of Prokofiev was featured throughout this film). PN: Yes! Discovering Prokofiev…and as you probably know, one thing leads to another and then you start listening to Shostakovich…and other Russian composers. TH: Right…the musical strands or connections that lead to new musical discoveries. I have been exploring French music lately that way. Gounod led to Chausson and then to other French composers…but always back to Debussy for me somehow. PN: I have been into 19th century French music a lot myself. I think it’s really overlooked and doesn’t get played in the concert hall nearly enough. I love Massenet…the Le Cid ballet music. Saint-Saens, Gounod….Debussy was one of my early loves in classical music. When I was in high school I played piano, and loved to try and play Claire de Lune. And Reverie. As I have gotten older I have gotten into some of his more abstract music….Pelleas et Melisande, some of his tone poems…La Mer. TH: Debussy is one of my favorite composers for sure. TH: I don’t get it! :) So what are some of your all-time favorite composers? I usually ask for top 5. PN: Who is on your list? TH: I always start with Bach, Mozart and Beethoven…..but then it gets so hard. I usually have Debussy at #4, and maybe Villa-Lobos at 5. PN: Your top 3 are unchanging…mine are so fluid .But I have to go with 10! Picking 5 is too hard. Another French composer who I think gets short changed and who I love is Rameau. He is way high on my list. I love Rimsky-Korsakov. And Dvorak. I don’t think he ever wrote a bad piece of music……everything is just…..you know…..
TH: I agree. I am still learning so much. PN: Like you, I have very eclectic music tastes. There are very few composers that I just totally dismiss. I can find worth in every different composer and genre. TH: I love it when I listen to a piece that is new to me….and I don’t get it! So I go back and try again…and again. And finally I develop an appreciation for it and it opens a new world to me. I recently wrote a blog about listening to Penderecki’s Stabat Mater for the first time…and how I did not get into it at all, but I kept with it and was finally rewarded. PN: It’s so interesting you bring him (Penderecki) up. When I first graduated from high school in ’77, I had some really horrible grunt job downtown, so I would escape by listening to KXTR…and this was before radio consultants…so they could PLAY Penderecki at 9:00 am in the morning. It was his Partita for Harpsichord and Electric Guitar. And that combination of instruments in my teenage mind was so incredible that it made me a life-long fan of his music. I don’t think even I would play that piece on the radio. That program director from back then probably doesn’t know that he made such an impression on me. TH: Janacek was a big early influence on me. PN: Yes….the Sinfonietta…and I love his piano music. I have grown into composers too. There are some composers who early on I didn’t like at all…like Chopin…it just seemed like easy listening. Wimpy music. But now, I see there is a lot of blood and guts in his music and he has climbed really high on my list. And another composer I liked OK but was not that passionate about but is now one of my favorites is Liszt. His piano music is unbelievable. He’s a very deep composer. His Piano Sonata in B-minor is really incredible. TH: Did you see the writing on the wall when KXTR was moved from 96.5 FM to AM? PN: Yes. The history is interesting. KXTR started back in the late 1950s by a group of classical music lovers who wanted to start an FM classical music radio station. It started in a house on Metcalf Avenue in Overland Park. Then it moved to the Country Club Plaza in the space below what is currently Starbucks. TH: Oh yeah…it used to be that German restaurant? PN: Right…it was below that. And then RLDS bought it and moved it out to Independence. And this is what I remember listening to back in the ‘70’s, they had a segment called Apple Tree Hill…very charming. And then Robert Ingram bought it from RLDS in 1975 and moved it out to KCK, in this little trailer with no windows. But it was in a lovely, charming little valley that had all kinds of wild life..and it was just really neat. And so they owned us until 1996 when Heritage Broadcasting bought it from the Ingram’s for $11 million dollars….who had paid $500,000 for it in 1975. Two years after that, in 1998, the Sinclair Broadcast Group bought it from Heritage for $22 million dollars! TH: Wow, so it went from $11 to $22 million in just 2 years! PN: In the late 1990’s, after the FCC deregulated the industry and companies could own as many stations in a market as they wanted…the price of radio stations just skyrocketed. But now they are in a financial jam because terrestrial radio has all sorts of competition. Their revenues are sinking. And these big corporations have these huge debts after spending millions of dollars acquiring these stations…and they can’t make it back. It will be interesting if one day they sell them off and they once again become mom and pop stations. TH: Maybe it will come full circle? PN: Maybe….In 2000, when they took us off FM, they told me at the last minute that they were moving us to AM. And the next day we were on a horrible signal (1250). Then we moved to 1660. Those were dark days. Although… we hung on for 10 years. TH: It’s not just the music that brings the listeners. It’s also the personalities…the interviews …the opportunity to hear music for the first time. Even with an AM signal, I still tuned in to hear what YOU had to say. And AM is OK for that. PN: In 2012, out of the blue, they just blew it up all together and put a business format on. I should have seen it coming, but still I wasn’t expecting it. Because we had no overhead. Everything we made was gravy for them. That’s the history of KXTR. TH: What have you been up to since then? TH: Coming up with ideas and topics to write about each week must be a challenge? PN: Yes, and gathering the information, interviewing people and all that. TH: Who are some local artists you have connected with? PN: I enjoyed talking to Charles Bruffy a couple of weeks ago (Director of the KC Chorale) about the Rachmaninoff Vespers. He is very entertaining. TH: I am looking forward to the Verdi in a couple of weeks. PN: You know, I just talked with Michael Stern about that a couple of days ago. That’s going to be in my column next Sunday. TH: That’s a BIG name to talk to! PN: Yes, and what I love about Michael Stern is he is so eloquent. He “writes” my column (laughs). He is an exacting musician which is why the symphony has become so good. They are on fire! And I don’t know if you have heard any of the recordings they have been making for Reference (recording label)? TH: So where do you think classical radio is headed? PN: I am doing Radio Bach now, and in it’s infancy in so many ways. It’s an online, 24 hours a day, 7 days a week broadcasting from Johnson County Community College. TH: So where do I go to hear it? TH: You can play what you want! PN: I think it will distinguish us. The thing about being on the internet is…we are competing with every classical station in the world. We want to give this a strong, local angle with arts leaders etc. We’re going to get there. TH: So you are optimistic about the future of classical music in society? PN: I think classical music is hip, and I’m not just saying that…I really honestly do. I think that people who don’t think its hip aren’t hip! TH: I love that! That may be the signature quote for this interview. Thank you so much for speaking with me.